Transportation in the United States is facilitated by road, air, rail, and waterways (via boats). The vast majority of passenger travel occurs by automobile for shorter distances, and airplane or railroad for some people, for longer distances. In descending order, most cargoes travel by railroad, truck, pipeline, or boat; air shipping is typically used only for perishables and premium express shipments. The overwhelming majority of roads in the United States are owned and maintained by state and local governments. Federally maintained roads are generally found only on federal lands (such as national parks) and at federal facilities (like military bases). The Interstate Highway System is partly funded by the federal government but owned and maintained by individual state governments. There are a few private highways in the United States, which use tolls to pay for construction and maintenance. There are many local private roads, generally serving remote or insular residences. Passenger and freight rail systems, bus systems, water ferries, and dams may be under either public or private ownership and operation. Civilian airlines are all privately owned and financed. Most airports are owned and operated by local government authorities, but there are also some private airports. The Transportation Security Administration has provided security at most major airports since 2001. The United States Department of Transportation and its divisions provide regulation, supervision, and funding for all aspects of transportation, except for customs, immigration, and security, which are the responsibility of the United States Department of Homeland Security. Each state has its own Department of Transportation, which builds and maintains state highways, and depending upon the state, may either directly operate or supervise other modes of transportation. Aviation law is almost entirely a federal matter, while automobile traffic laws are enacted and enforced by state and local authorities. Economic jurisdiction over tidelands is shared between the state and federal governments, while the United States Coast Guard is the primary enforcer of law and security on U.S. waterways. In most American cities but not all, the majority of work commutes are made by singly occupied automobiles. Passenger transportation is dominated by a network of over 3.9 million miles of highways which is pervasive and highly developed by global standards. Passenger transportation is dominated by passenger vehicles (including cars, trucks, vans, and motorcycles), which account for 86% of passenger-miles traveled. The remaining 14% was handled by planes, trains, and buses. As of 2003, there were 759 automobiles per 1,000 Americans. Bicycle usage is minimal with the American Community Survey reporting that bicycle commuting had a 0.61% mode share in 2012 (representing 856,000 American workers nationwide). Freight transportation is carried by a variety of networks. The largest percentage of US freight is carried by trucks (60%), followed by pipelines (18%), rail (10%), ship (8%), and air (0.01%). Other modes of transportation, such as parcels and intermodal freight accounted for about 3% of the remainder. Air freight is commonly used only for perishables and premium express shipments. The difference in percentage of rail's share by ton-miles and by weight (10% vs 38%) is accounted for by the extreme efficiency of trains. A single railroad locomotive may pull fifty boxcars full of freight while a truck only pulls one. Trucks surpass trains in the weight category due their greater numbers, while trains surpass trucks in the ton-miles category due to the vast distances they travel carrying large amounts of freight. Usually cargo, apart from petroleum and other bulk commodities, is imported in containers through seaports, then distributed by road and rail. The quasi-governmental United States Postal Service has a monopoly on letter delivery (except for express services) but several large private companies such as FedEx and UPS compete in the package and cargo delivery market. Speed to destination is an important factor in choosing a mode of transportation. In the late 18th century overland transportation was by horse, while water and river transportation was primarily by sailing vessel. The United States population was centered on its Atlantic coast, with all major population centers located on a natural harbor or navigable waterway. Low population density between these centers resulted in a heavy reliance on coastwise and riverboat shipping. The first government expenditures on highway transportation were funded to speed the delivery of overland mail, such as the Boston Post Road between New York City and Boston. Due to the distances between these population centers and the cost to maintain the roads, many highways in the late 18th century and early 19th century were private turnpikes. Other highways were mainly unimproved and impassable by wagon at least some of the year. Economic expansion in the late 18th century to early 19th century spurred the building of canals to speed goods to market, of which the most prominently successful example was the Erie Canal. Access to water transportation shaped the geography of early settlements and boundaries. For example, the Erie Canal escalated the Toledo War between Ohio and Michigan in the 1830s. The disputed Erie Triangle was awarded to Pennsylvania to give it access to Lake Erie. Most of West Florida was given to Mississippi and Alabama to guarantee their access to the Gulf of Mexico. Development of the mid-western and southern states drained by the Mississippi River system (Mississippi, Ohio and Missouri Rivers) was accelerated by the introduction of steamboats on these rivers in the early 19th Century. These three rivers (among others) also form the borders of several states. Prior to the introduction of steamboats, transit upstream was impractical because of strong currents on parts of these waterways. Steamboats provided both passenger and freight transportation until the development of railroads later in the 19th Century gradually reduced their presence. The rapid expansion of Railroads brought the canal boom to a sudden end, providing a quick, scheduled and year round mode of transportation that quickly spread to interconnect the states by the mid-19th century. During the industrialization of the United States after the Civil War, railroads, led by the transcontinental rail system in the 1860s, expanded quickly across the United States to serve industries and the growing cities. During the late 19th century, railroads often had built redundant routes to a competitor's road or built through sparsely populated regions that generated little traffic. These marginal rail routes survived the pricing pressures of competition, or the lack of revenue generated by low traffic, as long as railroads provided the only efficient economical way to move goods and people across the United States. In addition to the intercity passenger network running on Class I and II railroads, a large network of interurban (trolley or "street running") rail lines extended out from the cities and interchanged passenger and freight traffic with the railroads and also provided competition. The advent of the automobile signaled the end of railroads as the predominant transportation for people and began an era of mobility in the United States that added greatly to its economic output. The early 20th century Lincoln Highway and other auto trails gave way in the 1920s to an early national highway system making the automobile the preferred mode of travel for most Americans. Interurban rail service declined, followed by trolley cars due in part to the advent of motorized buses and the lack of dedicated rights-of-way but also by deliberate efforts to dismantle urban rail infrastructure (see Great American streetcar scandal). The scarcity of industrial materials during World War II slowed the growth of the automobile, briefly reemphasizing much of the nation's declining rail network. In the 1950s, the United States renewed building a network of high-capacity, high-speed highways to link its vast territory. The most important element is the Interstate Highway system, first commissioned in the 1950s by President Dwight D. Eisenhower and modeled after the Italian autostrada and the German Autobahn system. With the advent of commercial airline industry, intercity rail began to suffer a loss of ridership. As the civil air transportation network of airports and other infrastructure expanded, air travel became more accessible to the general population. Technological advances ushered in the jet age, which increased airline capacity, while decreasing travel times and the cost of flights. The costs of flying rapidly decreased intercity rail ridership by the late 1960s to a point where railroads could no longer profitably operate networks of passenger trains. By the early 1970s almost all passenger rail operation and ownership had been transferred to various federal, municipal and state agencies. Passenger rail came to be heavily subsidized, as it is today. Freight railroads continued to decline as motor freight captured a significant portion of the less-than-carload business. This loss of business, when combined the highly regulated operating environment and constrained pricing power, forced many railroads into receivership and the nationalization of several critical eastern carriers into the Consolidated Rail Corporation (Conrail). Deregulation of the railroads by the Staggers Act in 1980 created a regulatory environment more favorable to the economics of the railroad industry. In the 1990s, the increase in foreign trade and intermodal container shipping led to a revival of the freight railroads, which have effectively consolidated into two eastern and two western private transportation networks: Union Pacific and BNSF in the west, and CSX and Norfolk Southern in the east. Canadian National Railway took over the Illinois Central route down the Mississippi River valley. Wartime expediency encouraged long distance pipeline transport of petroleum and natural gas, which was greatly expanded in the middle 20th century to take over most of the domestic long-haul market. The Interstate highway system is the largest national controlled-access highway network in the world. Maximum speed limits in the United States vary by state from 60 to 85 mph. In comparison to some parts of the Western world, the United States relies more heavily on its roads both for commercial and personal transit. Car ownership is nearly universal except in the largest cities where extensive mass transit and railroad systems have been built. With the development of the extensive Eisenhower Interstate Highway System in the 1950s, both long-distance trips and daily the commute were mostly by private automobile. This network was designed to exacting federal standards in order to receive federal funding. The system, as of 2010, has a total length of 47,182 miles (75,932 km), making it the world's second longest after China's, and the largest public works project in US history. The Interstate system joined an existing National Highway System (a designation created for the legacy highway network in 1995), comprising 160,000 miles (256,000 kilometers) of roadway, a fraction of the total mileage of roads. The Interstate system serves nearly all major U.S. cities, often through the downtown areas (a point which triggered freeway and expressway revolts in the 1960s and 1970s). The distribution of virtually all goods and services involves Interstate highways at some point. 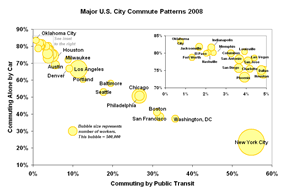 Residents of American cities commonly use urban Interstates to travel to their places of work. The vast majority of long-distance travel, whether for vacation or business, is by the national road network; of these trips, about one-third (by the total number of miles driven in the country in 2003) utilize the Interstate system. In addition to the routes of the Interstate system, there are those of the U.S. highway system, not to be confused with the above-mentioned National Highway System. These networks are further supplemented by State Highways, and the local roads of counties, municipal streets, and federal agencies, such as the Bureau of Indian Affairs. There are 3,980,817 miles (6,406,504 km) of roads in the United States, 2,605,331 miles (4,192,874 km) paved and 1,375,486 miles (2,213,630 km) unpaved. State highways are constructed by each state, but frequently maintained by county governments aided by funding from the state, where such counties exist as governing entities (mostly every state except the Northeastern). Counties construct and maintain all remaining roads outside cities, except in private communities. Local, unnumbered roads are often constructed by private contractors to local standards, then maintenance is assumed by the local government. All federal highways are maintained by state governments, although they receive federal aid to build and maintain freeways signed as part of the 46,000 mile (75,000 km) nationwide Interstate highway network. Changes by state initiative may be made with federal approval. A large number of expressways are actually government or privately operated toll roads in many East Coast and Midwestern states. West Coast freeways are generally free to users ("freeways", no toll charged per use), although since the 1990s there have been some small experiments with toll roads operated by private companies. After the collapse of the I-35W Mississippi River bridge in Minnesota in August 2007, the backlog of road and bridge maintenance across the country became an issue in transportation funding. The collapse prompted a tax increase in Minnesota to speed up bridge repairs, and action in other states, such as the Accelerated Bridge Program in Massachusetts, but after some debate no increase in federal funding. The 2013 I-5 Skagit River Bridge collapse, caused by a collision with an over-height truck, highlighted "fracture critical" bridges in which the failure of only one structural member will lead to complete collapse. According to the National Bridge Inventory, there are at least 600,000 bridges of 20 feet or more in length in the United States, all subject to deterioration in the absence of preventative maintenance. In December 2008, 72,868 bridges in the United States (12.1%) were categorized as "structurally deficient", representing an estimated $48 billion in repairs. President Barack Obama proposed $50 billion of spending on road and bridge repair, plus a national infrastructure bank, but as of 2013 Congress has not acted on these proposals. As of 2010, seat belt use is mandatory in all states except New Hampshire. Greyhound Lines is the largest intercity bus company in the United States, with routes in all parts of the continental U.S. There are also many smaller regional bus companies, many of which use the terminal and booking facilities provided by Greyhound. Intercity bus is, in most cases, the least expensive way to travel long distances in the United States. Traffic congestion, especially at rush hour, is a problem in many of the country's larger cities. A 2009 study found that traffic congestion costs the United States almost $87.2 billion. The economic costs of traffic congestion have increased 63% over the past decade, and despite the declining traffic volumes caused by the economic downturn, Americans still waste more than 2.8 billion US gallons (11,000,000 m3) of fuel each year as a result of traffic congestion. Motorists also waste 4.2 billion hours annually, or one full workweek per traveler. The trucking industry (also referred to as the transportation or logistics industry) involves the transport and distribution of commercial and industrial goods using commercial motor vehicles (CMV). 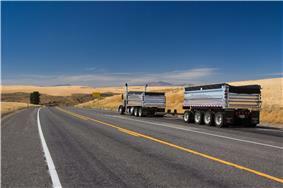 In this case, CMVs are most often trucks; usually semi trucks, box trucks, or dump trucks. A truck driver (commonly referred to as a "trucker") is a person who earns a living as the driver of a CMV. The trucking industry provides an essential service to the American economy by transporting large quantities of raw materials, works in process, and finished goods over land—typically from manufacturing plants to retail distribution centers. Trucks are also important to the construction industry, as dump trucks and portable concrete mixers are necessary to move the large amounts of rocks, dirt, concrete, and other construction material. Trucks in America are responsible for the majority of freight movement over land, and are vital tools in the manufacturing, transportation, and warehousing industries. Large trucks and buses require a commercial driver's license (CDL) to operate. Obtaining a CDL requires extra education and training dealing with the special knowledge requirements and handling characteristics of such a large vehicle. Drivers of CMVs must adhere to the hours of service, which are regulations governing the driving hours of commercial drivers. These, and all other rules regarding the safety of interstate commercial driving, are issued by the Federal Motor Carrier Safety Administration (FMCSA). The FMCSA is also a division of the United States Department of Transportation (USDOT), which governs all transportation-related industries such as trucking, shipping, railroads, and airlines. Some other issues are handled by another branch of the USDOT, the Federal Highway Administration (FHWA). Developments in technology, such as computers, satellite communication, and the internet, have contributed to many improvements within the industry. These developments have increased the productivity of company operations, saved the time and effort of drivers, and provided new, more accessible forms of entertainment to men and women who often spend long periods of time away from home. In 2006, the U.S. Environmental Protection Agency implemented revised emission standards for diesel trucks (reducing airborne pollutants emitted by diesel engines) which promises to improve air quality and public health. Cuba - No. Since the American embargo against Cuba, car ferry service from Florida and New Orleans to Havana ceased in 1962. The United States has advanced air transportation infrastructure which utilizes approximately 5,000 paved runways. In terms of passengers, seventeen of the world's thirty busiest airports in 2004 were in the United States, including the world's busiest, Hartsfield-Jackson Atlanta International Airport. In terms of cargo, in the same year, twelve of the world's thirty busiest airports were in the United States, including the world's busiest, Memphis International Airport. Private aircraft are also used for medical emergencies, government agencies, large businesses, and individuals, see general aviation. There is no single national flag airline; passenger airlines in the United States have always been privately owned. 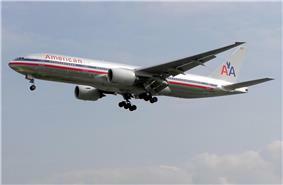 There are over 200 domestic passenger and cargo airlines and a number of international carriers. The major international carriers of the United States are Delta Air Lines, American Airlines, United Airlines and US Airways. Low-cost carrier Southwest Airlines operates no international routes, but has grown its domestic operations to a size comparable to the major international carriers. There is currently no government regulation of ticket pricing, although the federal government retains jurisdiction over aircraft safety, pilot training, and accident investigations (through the Federal Aviation Administration and the National Transportation Safety Board). The Transportation Security Administration provides security at airports. 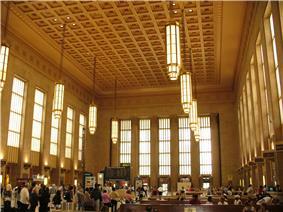 Passenger trains were the dominant mode of transportation until the mid-twentieth century. The introduction of jet airplanes on major U.S. routes and the completion of the Interstate Highway system accelerated a decline in intercity rail passenger demand during the 1960s, resulting in the sharp curtailment of passenger service by private railroads. This led to the creation of National Railroad Passenger Corporation (branded as Amtrak) by the federal government in 1971 to maintain limited intercity rail passenger service in most parts of the country. Amtrak serves most major cities but, outside of the Northeast, California, and Illinois, often by only few trains per day. Amtrak does not serve several major destinations, including Las Vegas, Nevada, and Phoenix, Arizona. Frequent service is available in regional corridors between certain major cities, particularly the Northeast Corridor between Washington, D.C., New York City and Boston, between New York City and Albany, around Chicago, and in parts of California and the Pacific Northwest. The Alaska Railroad is the only other intercity passenger railroad still operating, and it has no connections with Amtrak. The United States makes extensive use of its rail system for freight. According to the Association of American Railroads: "U.S. freight railroads are the world's busiest, moving more freight than any rail system in any other country. In fact, U.S. railroads move more than four times as much freight as do all of Western Europe's freight railroads combined." Rail freight has a major national bottleneck in Chicago and the Midwest (about one-third of the nation's freight trains pass through the region), which is the subject of a $1.5 billion infrastructure improvement project. Canada - Yes. 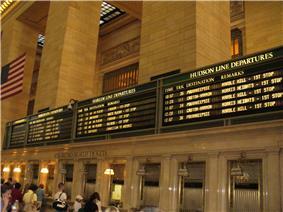 Amtrak connections run daily between New York City and Montreal, New York City and Toronto, and Seattle and Vancouver. Alaska is currently rail-accessible by train ferry from Bellingham, Washington and narrow gauge railroad from Whitehorse, Yukon Territory to Skagway. A proposed link to the Continental United States would link Alaska and Canada via the Yukon and British Columbia. The Canadian National Railway system includes the former Illinois Central route from Chicago via Memphis to New Orleans. Mexico - Yes. Several private firms run touristic trains from near El Paso, Texas, through Chihuahua, Chihuahua and the Copper Canyon to El Fuerte, Sinaloa. Such trains also run from Nogales, Sonora, but no U.S. passenger trains run near Nogales, Arizona, on the other side of the border. Another touristic train runs occasional trains between Campo, California, and Tecate, Baja California. Cuba - No. Since the United States embargo against Cuba, train ferry service from Florida and New Orleans to Havana ceased. Russia - No. But proposed tunnel or bridge under or over Bering Straits to connect with Trans-Siberian Railway. With few exceptions, the rail gauge is standard gauge 4 ft 8 1⁄2 in (1,435 mm). The White Pass and Yukon Route from Skagway, Alaska to Whitehorse, Yukon by way of Bennett, British Columbia is 3 ft (914 mm) gauge. The miles traveled by passenger vehicles in the United States fell by 3.6% in 2008, while the number of trips taken on mass transit increased by 4.0%. At least part of the drop in urban driving can be explained by the 4% increase in the use of public transportation. Most medium-sized cities have some sort of local public transportation, usually a network of fixed bus routes. Among larger cities many of the older cities also have metro rail systems (also known as heavy rail in the United States), while the newer cities found in the Sun Belt either have modest light rail systems or have no intracity rail at all. 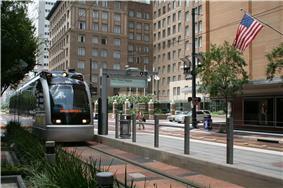 Requires that all Federal agencies offer their employees transit pass transportation fringe benefits. Federal agencies within the National Capital Region have successful transit pass benefits programs. Increases the federal cost-share of grants for construction of additional parking facilities at the end of subway lines from 80 to 100% to cover an increase in the number of people taking mass transit. Creates a pilot program for vanpool demonstration projects in urban and rural areas. Increases federal help for local governments to purchase alternative fuel buses, locomotives, and ferries from 90 to 100%. Water transport is largely used for freight. Fishing and pleasure boats are numerous, and passenger service connects many of the nation's islands and remote coastal areas, crosses lakes, rivers, and harbors, and provides alternative access to Alaska which bypasses Canada. Several major seaports in the United States include New York on the east coast, New Orleans and Houston on the gulf coast, and Los Angeles on the west coast. The interior of the U.S. also has major shipping channels, via the Great Lakes Waterway, St. Lawrence Seaway and the Mississippi River System. Freight on the Mississippi River system is carried on barges pushed by approximately 8000 "towboats" and largely consists of bulk goods, such as petrochemicals, grain and cement. Many U.S. ports are served by cruise ships. Popular destinations include the Caribbean, the Mexican Riviera, Hawaii and the Inside Passage to Alaska. Automobile ferries operate in many locations where bridges are impractical and in congested metropolitan areas, including New York City and San Francisco Bay. The United States has 25,482 miles (41,009 km) of navigable inland channels (rivers and canals), exclusive of the Great Lakes. Out of this 12,006 miles (19,322 km) is used in commerce. About 15,000 miles (24,000 km) of the Mississippi River System are presently navigable, although not all is used for commerce. The Saint Lawrence Seaway of 2,342 miles (3,769 km), including the Saint Lawrence River of 1,900 miles (3,100 km), is shared with Canada. Most U.S. exports and imports are on foreign ships. The 1920 Jones Act bars foreign ships from trade within the United States, thus creating a domestic "Jones Act fleet". Deck officers and ship's engineers of U.S.-flagged ships are usually trained at one of the established maritime academies. The federal military has a dedicated system of bases with runways, aircraft, watercraft, conventional cars and trucks, and armored and special-purpose vehicles. During times of war, it may commandeer private infrastructure and vehicles as authorized by Congress and the President. Federal, state, and local tax revenues support upkeep of most roads, which are generally free to drivers. There are also some toll roads and toll bridges. Most other forms of transportation charge a fee for use as they are not given much, if any, tax support by Congress. Government funding of transportation exists at many levels. Federal funding for highway, rail, bus, water, air, and other forms of transportation is allocated by Congress for several years at a time. The current authorization bill is the Safe, Accountable, Flexible, Efficient Transportation Equity Act: A Legacy for Users (SAFETEA-LU), which runs from 2005 to 2009. A Congressionally chartered committee is considering future funding issues. Though Major Investment Study and both a Draft and a Final Environmental Impact Review. A patchwork of federal laws and accounts govern the allocation of federal transportation dollars, most of which is reserved for capital projects, not operating expenses. Some roads are federally designated as part of the National Highway System and get preferential funding as a result, but there are few federally maintained roads outside of Washington, D.C., and national parks. State governments are sovereign entities which use their powers of taxation both to match federal grants, and provide for local transportation needs. Different states have different systems for dividing responsibility for funding and maintaining road and transit networks between the state department of transportation, counties, municipalities, and other entities. Typically cities or counties are responsible for local roads, financed with block grants and local property taxes, and the state is responsible for major roads that receive state and federal designations. Many mass transit agencies are quasi-independent and subsidized branches of a state, county, or city government. According to the U.S. Department of Transportation (DOT): "Transportation's vital importance to the U.S. economy is underscored by the fact that more than $1 out of every $10 produced in the U.S. gross domestic product is related to transportation activity. This includes all aspects of transportation, including the movement of goods and the purchase of all transportation-related products and services as well as the movement of people". Employment in the transportation and material moving industry accounted for 7.4% of all employment, and was the 5th largest employment group in the United States. The United States invests 0.6% of its GDP on transportation annually. Two-thirds of U.S. oil consumption is due to the transportation sector. The "Energy Independence and Security Act of 2007" has a significant impact on U.S. Energy Policy. The United States—an important export country for food stocks—will convert 18% of its grain output to ethanol in 2008. Across the United States, 25% of the whole corn crop went to ethanol in 2007. The percentage of corn going to biofuel is expected to go up. In 2006, U.S. Senators introduced the BioFuels Security Act, which would mandate the production of dual-fuel vehicles and the sale of E85 ethanol fuel. ^ a b "Table 1-40: U.S. Passenger-Miles (Millions)". Bureau of Transportation Statistics. US Department of Transportation. Retrieved 5 December 2014. ^ "Table 1-1: System Mileage Within the United States". National Transportation Statistics. Bureau of Transportation Statistics. Retrieved 2008-03-12. ^ A "passenger-mile" is one passenger transported one mile. For example, one vehicle traveling 3 miles carrying 5 passengers generates 15 passenger-miles. ^ "Car Free Day 2006: Nearly One Car per Two Inhabitants in the EU25 in 2004". Europa, Eurostat Press Office. 2006-09-19. Retrieved 2007-08-15. ^ Pucher, John, and Lewis Dijkstra (February 2000). "Making Walking and Cycling Safer: Lessons from Europe" (PDF). Transportation Quarterly. Transportation Alternatives. Retrieved 2007-08-15. ^ Herman, Marc (October 2013). "Commuting by Bike Was Way Up Last Year". Pacific Standard. Retrieved 2013-11-07. ^ "3-1 Freight Shipments Within the U.S. by Mode". Bureau of Transportation Statistics. Retrieved 2014-06-11. ^ "Table 1 - Commercial Freight Activity in the United States by Mode of Transportation: 2002". Freight in America. Bureau of Transportation Statistics. Retrieved 2008-02-29. ^ Bureau of Transportation Statistics, National Transportation Statistics . Passenger-miles by mode: Table 1-40, p. 74. Air and car fatalities: Table 2-1, p. 125. Transit fatalities: Table 2-32, p. 168. Railroad fatalities: Table 2-39, p. 181. Only fatalities among on-board passengers are counted. ^ Office of Highway Policy Information (December 2011). ﻿Table HM-20: Public Road Length - 2010﻿ (Report). Federal Highway Administration. http://www.fhwa.dot.gov/policyinformation/statistics/2010/hm20.cfm. Retrieved May 9, 2012. ^ "The Year of the Interstate". Retrieved 2008-04-29. ^ Caltrans (2006). "The Interstate Highway System Turns 50". Retrieved 2008-01-10. ^ "Table 1-36: Long-Distance Travel in the United States by Selected Trip Characteristics". Bureau of Transportation Statistics. 1995. Retrieved 2006-12-21. ^ "Annual Vehicle Distance Traveled in Miles and Related Data". Federal Highway Administration. 2003. Retrieved 2006-12-21. ^ Highway Statistics 2011. Federal Highway Administration http://www.fhwa.dot.gov/policyinformation/statistics/2011/hm12.cfm . Retrieved 21 June 2013. ^ Economic factors tap the brakes on traffic congestion. July 8, 2009. Accessed 2/09/2010. ^ a b Luxner, Larry. "Shipping firm sees potential gold mine in Florida-Cuba passenger ferry service." CubaNews Sept. 2009: 1+. General Reference Center Gold. Web. 9 Feb. 2010. ^ "Memphis maintains hold as largest cargo airport by weight". Commercialappeal.com. 2009-02-04. Retrieved 2009-02-04. ^ Bucklew, Keith J. (Fall 2007). "The heartland fast-freight rail system.". Entrepreneur.com. Retrieved 2009-06-18. ^ "CREATE — Keeping the Go in Chicago". CREATE. Retrieved 2009-06-18. ^ Nancy Pelosi. "Speaker Nancy Pelosi". Retrieved 2009-06-18. ^ a b New Orleans Gateway: The Mississippi River. ^ "Cruise industry predicts smooth sailing." Colorado Springs Business Journal [CO] 27 Apr. 2007. General Reference Center Gold. Web. 9 Feb. 2010. ^ "Officials eye ferries to help ease congestion: Water Transit Agency hopes to build eight new terminals to go along with the six already in use." Contra Costa Times [Walnut Creek, CA] 26 June 2006. General Reference Center Gold. Web. 9 Feb. 2010. ^ a b "CIA — THe World Factbook — United States". Retrieved 2009-06-14. ^ Maritime academies include the federal United States Merchant Marine Academy in Kings Point, New York, Maine Maritime Academy in Castine, Massachusetts Maritime Academy in Buzzard's Bay, State University of New York Maritime College in the Bronx, Texas Maritime Academy in Galveston, California Maritime Academy in Vallejo, and Great Lakes Maritime Academy in Traverse City, Michigan. ^ "National Surface Transportation Infrastructure Financing Commission". Retrieved 2009-06-18. ^ "The Nation's Freight". Freight in America. U.S. Department of Transportation — Bureau of Transportation Statistics. Retrieved 2008-02-08. ^ "Employment and Wages by Major Occupational Group and Industry" (PDF). Bureau of Labor Statistics. Retrieved 2008-02-29. ^ Bookman, Jay (8 October 2010). "Opinion:Toll roads, taxes and why voters distrust leaders". Atlanta, Georgia: Atlanta Journal-Constitution. pp. A18. ^ "Energy Independence and Security Act of 2007 (Enrolled as Agreed to or Passed by Both House and Senate)". Retrieved 2008-01-18.